On the intersection of Stefan cel Mare Street and Mihai Viteazul Street, a small square is located, which is dominated by the “Church of Chains“, a Calvinist church. 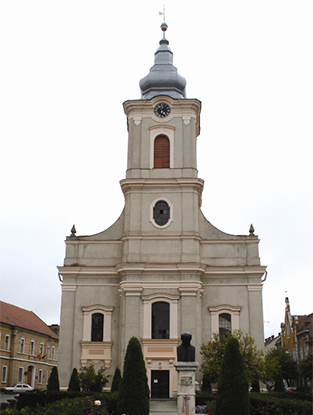 In the early 16th century, Satu Mare became Calvinist; a church was only established in 1622. First building plans for a proper church were made in the mid-18th century, but the corner stone was only laid under Joseph II. Construction works took from 1788 to 1806. The building in late rococo style was designed by Zsigmon Preinlich. Next to the recess, the original bell from a church destroyed by the Kurucs can be found. It had been financed by the Reformist citizens of Satu Mare in 1633 and made by bell founder Georg Weird in Prešov. On occasion of the 100th anniversary, an organ from the workshop of Otto Riegel in Budapest was installed in the church.